25 May, 2017. It was a Thursday. React has been around for a few years now and there are quite a few tutorials available. Unfortunately, many are outdated, overly complex, or gloss over configuration for getting started. Tutorials which side-step configuration by using jsfiddle or code generator options are great when you’re wanting to just focus on the framework features itself, but many tutorials leave beginners struggling to piece things together when you’re ready to create a simple react application from scratch. This tutorial is intended to help beginners get up and going with React by manually walking through a minimal setup process. This tutorial is merely intended to help walk you through the steps to getting a simple React example up and running. When you’re ready to dive into actually learning the React framework, a great list of tutorials can be found here. There are a several build, transpiler, or bundling tools from which to select when working with React. For this tutorial, we’ll be using be using Node, NPM, Webpack, and Babel. Download and install Node for your target platform. Node distributions can be obtained here. From a command line prompt, create a folder where you plan to develop your example. This results in the creation of a package.json file. While not technically necessary for this example, creating this file will allow us to persist our packaging and runtime dependencies. React is broken up into a core framework package and a package related to rendering to the Document Object Model (DOM). Babel is a transpiler, which is to say it’s a tool from converting one language or language version to another. In our case, we’ll be converting EcmaScript 2015 to EcmaScript 5. Webpack is a module bundler. We’ll be using it to package all of our scripts into a single script we’ll include in our example Web page. Babel loader is a Webpack plugin for using Babel to transpile scripts during the bundling process. Babel presets are collections of plugins needed to support a given feature. For example, the latest version of babel-preset-es2015 at the time this writing will install 24 plugins which enables Babel to transpile ECMAScript 2015 to ECMAScript 5. We’ll be using presets for ES2015 as well as presets for React. The React presets are primarily needed for processing of JSX. In order to tell Babel which presets we want to use when transpiling our scripts, we need to provide a babel config file. In order to tell Webpack we want to use Babel, where our entry point module is, and where we want the output bundle to be created, we need to create a Webpack config file. For our example, we’ll just be creating a simple component which renders the text “Hello, React!”. Briefly, this code includes the react and react-dom modules, defines a HelloWorld class which returns an element containing the text “Hello, React!” expressed using JSX syntax, and finally renders an instance of the HelloWorld element (also using JSX syntax) to the DOM. If you’re completely new to React, don’t worry too much about trying to fully understand the code. Once you’ve completed this tutorial and have an example up and running, you can move on to one of the aforementioned tutorials, or work through React’s Hello World example to learn more about the syntax used in this example. Next, we’ll create a simple html file which includes the bundled output defined in step 10 and declare a <div> element with the id “root” which is used by our react source in step 11 to render our HelloWorld component. To convert our app/index.js source to ECMAScript 5 and bundle it with the react and react-dom modules we’ve included, we simply need to execute webpack. Congratulations! After completing this tutorial, you should have a pretty good idea about the steps involved in getting a basic React app up and going. Hopefully this will save some absolute beginners from spending too much time trying to piece these steps together. 30 August, 2016. It was a Tuesday. A proposal to use TypeScript was recently made within my development team, so I’ve taken a bit of time to investigate the platform. This article reflects my thoughts and conclusions on where the platform is at this point. TypeScript made it’s debut in late 2012 and was first released in April 2014. Community interest has been fairly marginal since it’s debut, but has shown an increase since an announcement that the next version of Google’s popular Angular framework would be written in TypeScript. TypeScript provides an optional type system which can aid in catching certain types of programing errors at compile time. The information derived from the type system also serves as the foundation for most of the tooling surrounding TypeScript. In this example, a Person interface is declared with two string properties: firstName and lastName. Next, a Greeter class is created with a greet() function which is declared to take a parameter of type Person. Next, instances of Greeter and Person are instantiated and the Greeter instance’s greet() function is invoked passing in the Person instance. At compile time, TypeScript is able to detect whether the object passed to the greet() function conforms to the Person interface and whether the values assigned to the expected properties are of the expected type. While the type system and programming paradigm introduced by TypeScript are its key features, it’s really the tooling facilitated by the type system that makes the platform shine. Being notified of syntax errors at compile time is helpful, but it’s really the productivity that stems from features such as design-time type checking, intellisense/code-completion, and refactoring that make TypeScript compelling. TypeScript is currently supported by many popular IDEs including Visual Studio, WebStorm, Sublime Text, Brackets, and Eclipse. Moreover, interfaces maintained by 3rd-party sources are somewhat antithetical to their primary purpose. Interfaces should serve as contracts for the behavior of a library. If the interfaces are maintained by a 3rd-party, however, they can’t be accurately described as “contracts” since no implicit promise is being made by the library author that the interface being provided accurately matches the library’s behavior. It’s probably the case that this doesn’t prove to be much of an issue in practice, but at minimum I would think relying upon type definitions created by 3rd parties would eventually lead to the available type definitions lagging behind new releases of the libraries being used. Introducing a typesystem is a bit of a double-edged sword. While a type system can provide a lot of benefits, it also adds syntactical overhead to a codebase. In some cases this can result in the code you maintain actually being harder to read and understand than the code being generated. This can be illustrated using Anders Hejlsberg’s example presented at Build 2014. Comparing the two signatures, which is easier to understand? It might be reasoned that the TypeScript version should be easier to understand given that it provides more information, but many would disagree that this is in fact the case. The reason for this is that the TypeScript version adds quite a bit of syntax to explicitly describe information that can otherwise be deduced fairly easily. In many ways this is similar to how we process natural language. When we communicate, we don’t encode each word with its grammatical function (e.g. “I [subject] bought [past tense verb] you [indirect object] a [indefinite article] gift [direct object].”) Rather, we rapidly and subconsciously make guesses based on familiarity with the vocabulary, context, convention and other such signals. In the case of the sortBy example, we can guess at the parameters and return type for the function faster than we can parse the type syntax. This becomes even easier if descriptive names are used (e.g. sortByKey(array, keySelector)). Sometimes implicit expression is simply easier to understand. Ultimately, the real negative I see with this is that (at least right now) TypeScript doesn’t represent how the majority of Web development is being done in the community. This has implications on the availability of documentation, availability of online help, candidate pool size, marketability, and skill portability. For those considering TypeScript, the following are a couple of options you might consider before converting just yet. Why Not Just use ES2015? That’s a great option! Learning ES2015 is a huge leap from ES5. Once you master ES2015, I argue that going from there to TypeScript is a very small step. In many ways, taking the time to learn ECMAScript 2015 is the best option even if you think you’re ready to start using TypeScript. Making the journey from ES5 to ES2015 and then later on to TypeScript will help you to clearly understand which new features are standard ECMAScript and which are TypeScript … knowledge you’re likely to be fuzzy on if you move straight from ES5 to TypeScript. For the most part, Flow’s type system is identical to that of TypeScript, so it shouldn’t be too hard to convert to TypeScript down the road if desired. Several IDEs have Flow support including Web Storm, Sublime Text, Atom, and of course Facebook’s own Nuclide. As of August 2016, Flow also supports Windows. Unfortunately this support has only recently become available, so Flow doesn’t yet enjoy the same IDE support on Windows as it does on OSX and Linux platforms. IDE support can likely be expected to improve going forward. If you’ve found the primary appeal of TypeScript to be the immediate feedback you receive from the tooling, another methodology for achieving this (which has far greater benefits) is the practice of Test-Driven Development (TDD). The TDD methodology not only provides a rapid feedback cycle, but (if done properly) results in duplication-free code that is more maintainable by constraining the team to only developing the behavior needed by the application, and results in a regression-test suite which provides a safety net for future modifications as well as documentation for how the system is intended to be used. Of course, these same benefits can be realized with TypeScript development as well, but teams practicing TDD may find less need for TypeScript’s compiler-generated error checking. After taking some time to explore TypeScript, I’ve found that aspects of its ecosystem are very compelling, particularly the tooling that’s available for the platform. Nevertheless, it still seems a bit early to know what role the platform will play in the future of Web development. 22 August, 2016. It was a Monday. I recently went through the process of setting up a new development environment on Windows which included installing Git for Windows. At one point in the course of tweaking my environment, I found myself trying to determine which config file a particular setting originated. The command ‘git config –list’ showed the setting, but ‘git config –list –system’, ‘git config –list –global’, and ‘git config –list –local’ all failed to reflect the setting. Looking at the options for config, I discovered you can add a ‘–show-origin’ which led to a discovery: Git for Windows has an additional location from which it derives your configuration. It turns out, since the last time I installed git on Windows, a change was made for the purposes of sharing git configuration across different git projects (namely, libgit2 and Git for Windows) where a Windows-specific location is now used as the lowest setting precedence (i.e. the default settings). This is the file: C:\ProgramData\Git\config. It doesn’t appear git added a way to list or edit this file as a well-known location (e.g. ‘git config –list windows’), so it’s not particularly discoverable aside from knowing about the ‘–show-origin’ switch. Perhaps this article might help the next soul who finds themselves trying to figure out from where some seemingly magical git setting is originating. 28 February, 2016. It was a Sunday. I’ve always had an interest in application build processes. From the start of my career, I’ve generally been in the position of establishing the solution architecture for the projects I’ve participated in and this has usually involved establishing a baseline build process. My career began as a Unix C developer while still in college where much of my responsibilities required writing tools in both C and various Unix shell scripting languages which were deployed to other workstations throughout the country. From there, I moved on to Unix C-CGI Web development and worked a number of years with Make files. With the advent of Java, I begin using tools like Ant and Maven for several more years before switching to the .Net platform where I used open source build tools like NAnt until Microsoft introduced MSBuild with its 2.0 release. Upon moving to the Austin, TX area, I was greatly influenced by what was the early seat of the Alt.Net movement. It was there where I abandoned what in hindsight has always been a ridiculous idea … trying to script a build using XML. For the next 4-5 years, I used Rake to define all of my builds. Starting last year, I began using Gulp and associated tooling on the Node platform for authoring .Net builds. Throughout this journey of working with various build technologies, I’ve formed a few opinions along the way. One of these opinions is that the Build process shouldn’t be coupled to the Continuous Integration process. A project should have a build process which exists and can be executed independent of the particular continuous integration tool one chooses. This allows builds to be created and maintained on the developer’s local machine. The particular build steps involved in building a given application are inherently part of its ontology. What compilers and preprocessors need to be used, how dependencies are obtained and published, when and how configuration values are supplied for different environments, how and where automated test suites are run, how the application distribution is created … all of these are concerns whose definition and orchestration are particular to a given project. Such concerns should be encapsulated in a build script which lives with the rest of the application source, not as discrete build steps defined within your CI tool. Ideally, builds should never break, but when they do it’s important to resolve the issue as quickly as possible. Not being able to run a build locally means potentially having to repeatedly introduce changes until the build is fixed. This tends to pollute the source code commit history with comments like: “Fixing the build”, “Fixing the build for realz this time”, and “Please let this be it … I’m ready to go home”. Of course, there are times when a build can break because of environmental issues that may not be mirrored locally (e.g. lack of disk space, network related issues, 3rd-party software dependencies, etc. ), but encapsulating as much of your build as possible goes a long way to keeping builds running along smoothly. Anyone on your team should be able to clone/check-out the project, issue a single command from the command line (e.g. gulp, rake, psake, etc.) and watch the full build process execute including any pre-processing steps, compilation, distribution packaging and even deployment to a target environment. Aside from being able to run a build locally, decoupling the build from the CI process allows the technologies used by each to vary independently. Switching from one CI tool to another should ideally just require installing the software, pointing it to your source control, defining the single step to issue the build, and defining the triggers that initiate the process. The creation of a project distribution and the scheduling mechanism for how often this happens are separate concerns. Just because a CI tool allows you to script out your build steps doesn’t mean you should. 1 November, 2015. It was a Sunday. Earlier this year I joined a development team which chose Entity Framework for the persistence needs of a new greenfield project. While I’ve worked on a few projects which used Entity Framework here and there over the years, the bulk of my experience has been with NHibernate and, more recently, Dapper.Net. As a result, there hasn’t been all that much occasion for me to explore it in any level of depth until this year. 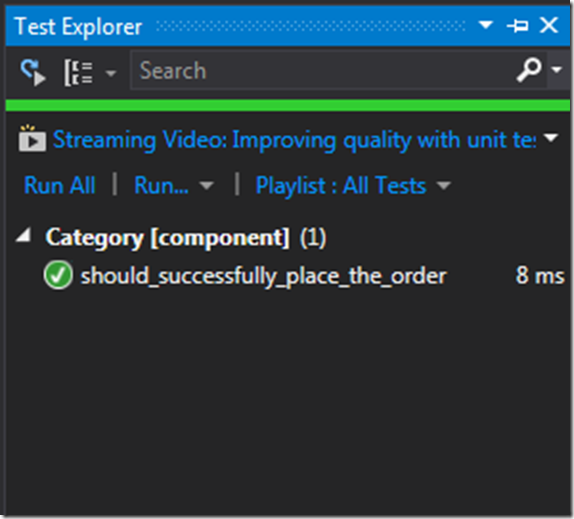 One area I recently took some time to research is how the Unit of Work pattern is best implemented within the context of using Entity Framework. While the topic is still relatively fresh on my mind, I thought I’d use this as an opportunity to create a catalog of various approaches I’ve encountered and include some thoughts about each approach. To start, it may be helpful to give a basic definition of the Unit of Work pattern. A Unit of Work can be defined as a collection of operations that succeed or fail as a single unit. Given a series of operations which need to be executed in response to some interaction with an application, it’s often necessary to ensure that none of the operations cause side-effects if any one of them fails. This is accomplished by having participating operations respond to either a commit or rollback message indicating whether the operation performed should be completed or reverted. A Unit of Work can consist of different types of operations such as Web Service calls, Database operations, or even in-memory operations, however, the focus of this article will be on approaches to facilitating the Unit of Work pattern with Entity Framework. With that out of the way, let’s take a look at various approaches to facilitating the Unit of Work pattern with Entity Framework. The first approach to achieving a Unit of Work around a series of Entity Framework operations is to simply create an instance of a DbContext class, make changes to one or more DbSet instances, and then call SaveChanges() on the context. Entity Framework automatically creates an implicit transaction for changesets which include INSERTs, UPDATEs, and DELETEs. The benefit of this approach is that a transaction is created only when necessary and is kept alive only for the duration of the SaveChanges() call. Some drawbacks to this approach, however, are that it leads to opaque dependencies and adds a bit of repetitive infrastructure code to each of your applications services. If you prefer to work directly with Entity Framework then this approach may be fine for simple needs. In general, I find using TransactionScope to be a good general-purpose solution for defining a Unit of Work around Entity Framework operations as it works with ADO.Net, all versions of Entity Framework, and other ORMs which provides the ability to use multiple libraries if needed. Additionally, it provides a foundation for building a more comprehensive Unit of Work pattern which would allow other types of operations to enlist in the Unit of Work. Caution should be exercised when using TransactionScope, however, as certain operations can implicitly escalate the transaction to a distributed transaction causing undesired overhead. For those choosing solutions involving TransactionScope, I would recommend educating yourself on how and when transactions are escalated. While I find using the TransactionScope class to be a good general-purpose solution, using it directly does couple your services to a specific strategy and adds a bit of noise to your code. While it’s a viable choice, I would recommend inverting the concerns of managing the Unit of Work boundary as shown in approaches we’ll look at later. As can be seen from the example, this approach adds quite a bit of infrastructure noise to your code. While not something I’d recommend standardizing upon, this approach provides another avenue for sharing transactions between Entity Framework and straight ADO.Net code which might prove useful in certain situations. In general, I wouldn’t recommend such an approach. This is the approach recommended by Microsoft for achieving transactions with Entity Framework going forward. If you’re deploying applications with Entity Framework 6 and beyond, this will be your safest choice for Unit of Work implementations which only require database operation participation. Similar to a couple of the previous approaches we’ve already considered, the drawbacks of using this directly are that it creates opaque dependencies and adds repetitive infrastructure code to all of your application services. This is also a viable option, but I would recommend coupling this with other approaches we’ll look at later to improve the readability and maintainability of your application services. It isn’t hard to imagine how this approach was conceived given it closely mirrors the typical implementation of the DbContext instance you find in Entity Framework guidance where public instances of DbSet are exposed for each aggregate root. Given this pattern is presented on the ASP.Net website and comes up as one of the first results when doing a search for “Entity Framework” and “Unit of Work”, I imagine this approach has gained some popularity among .Net developers. There are, however, a number of issues I have with this approach. First, this approach leads to opaque dependencies. Due to the fact that classes interact with repositories through the UnitOfWork instance, the client interface doesn’t clearly express the inherent business-level collaborators it depends upon (i.e. any aggregate root collections). Second, this violates the Open/Closed Principle. To add new aggregate roots to the system requires modifying the UnitOfWork each time. Third, this violates the Single Responsibility Principle. The single responsibility of a Unit of Work implementation should be to encapsulate the behavior necessary to commit or rollback an set of operations atomically. The instantiation and management of repositories or any other component which may wish to enlist in a unit of work is a separate concern. Lastly, this results in a nominal abstraction which is semantically coupled with Entity Framework. The example code for this approach sets forth an interface to the UnitOfWork implementation which isn’t the approach used in the aforementioned Microsoft article. Whether you take a dependency upon the interface or the implementation directly, however, the presumption of such an abstraction is to decouple the application from using Entity Framework directly. While such an abstraction might provide some benefits, it reflects Entity Framework usage semantics and as such doesn’t really decouple you from the particular persistence technology you’re using. While you could use this approach with another ORM (e.g. NHibernate), this approach is more of a reflection of Entity Framework operations (e.g. it’s flushing model) and usage patterns. As such, you probably wouldn’t arrive at this same abstraction were you to have started by defining the abstraction in terms of the behavior required by your application prior to choosing a specific ORM (i.e. following The Dependency Inversion Principle). You might even find yourself violating the Liskof Substitution Principle if you actually attempted to provide an alternate ORM implementation. Given these issues, I would advise people to avoid this approach. For those inclined to make all dependencies transparent while maintaining an abstraction from Entity Framework, the next strategy may seem the natural next step. This strategy involves creating an abstraction around the call to DbContext.SaveChanges() and requires sharing a single instance of DbContext among all the components whose operations need to participate within the underlying SaveChanges() call as a single transaction. While this approach improves upon the opaque design of the Repository Manager, there are several issues I find with this approach as well. Similar to the first example, this UnitOfWork implementation is still semantically coupled to how Entity Framework is urging you to think about things. Entity Framework wants you to call SaveChanges() whenever you’re ready to flush any INSERT, UPDATE, or DELETE operations you’ve issued against the database and this abstraction basically surfaces this behavior. If you were to use an alternate framework that supported a different flushing model (e.g. NHibernate), you likely wouldn’t end up with the same abstraction. Moreover, this approach has no definitive Unit of Work boundary. With this approach, you aren’t defining a logical Unit of Work, but are merely injecting a UnitOfWork you can participate within. 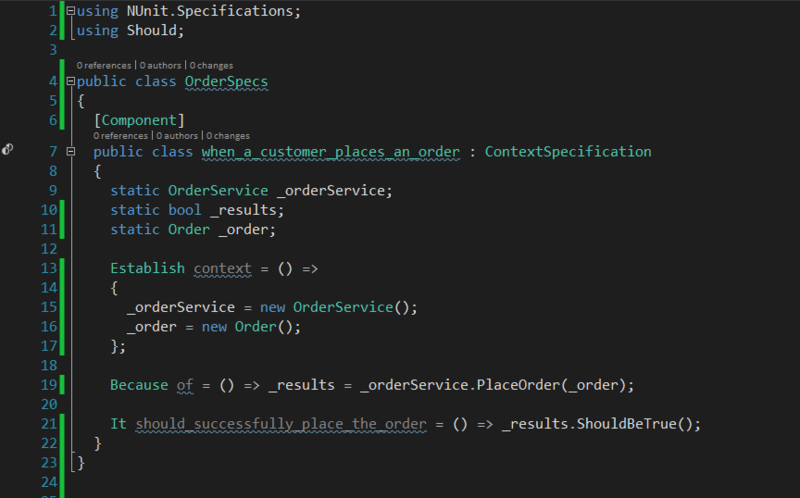 When you invoke the underlying DBContext.SaveChanges() method, it isn’t explicit what work will be committed. While this approach corrects a few design issues I find with the Repository Manager, overall I like this approach even less. At least with the Repository Manager approach you have a defined Unit of Work boundary which is kind of the whole point. My recommendation would be to avoid this approach as well. This approach shares many of the same issues with the previous one. While it reduces a bit of infrastructure noise, it’s still semantically coupled to Entity Framework’s approach and still lacks a defined Unit of Work boundary. Additionally, it lacks clarity as to what happens when you call the SaveChanges() method. Given the Repository pattern is intended to be a virtual collection of all the entities within your system of a given type, one might suppose a method named “SaveChanges” means that you are somehow persisting any changes made to the particular entities represented by the repository (setting aside the fact that doing so is really a subversion of the pattern’s purpose). On the contrary, it really means “save all the changes made to any entities tracked by the underlying DbContext”. I would also recommend avoiding this approach. A pattern I’m a bit embarrassed to admit has been characteristic of many projects I’ve worked on in the past (though not with EF) is to create a Unit of Work implementation which is scoped to a Web Application’s Request lifetime. Using this approach, whatever method is used to facilitate a Unit of Work is configured with a DI container using a Per-HttpRequest lifetime scope and the Unit of Work boundary is opened by the first component being injected by the UnitOfWork and committed/rolled-back when the HttpRequest is disposed by the container. While this approach eliminates the need for your services to be concerned with the Unit of Work infrastructure, the biggest issue with this is when an error happens to occur. When the application can’t successfully commit a transaction for whatever reason, the rollback occurs AFTER you’ve typically relinquished control of the request (e.g. You’ve already returned results from a controller). When this occurs, you may end up telling your customer that something happened when it actually didn’t and your client state may end up out of sync with the actual persisted state of the application. While I used this strategy without incident for some time with NHibernate, I eventually ran into a problem and concluded that the concern of transaction boundary management inherently belongs to the application-level entry point for a particular interaction with the system. This is another approach I’d recommend avoiding. Functionally, this is a viable approach to facilitating a Unit of Work boundary with Entity Framework. A few drawbacks, however, are that the dependency upon the Unit Of Work implementation is opaque and that it’s coupled to a specific implementation. While this isn’t a terrible approach, I would recommend other approaches discussed here which either surface any dependencies being taken on the Unit of Work infrastructure or invert the concerns of transaction management completely. While I personally prefer to invert such concerns, I consider this to be a sound approach. As a side note, if you decide to use this approach, you might also consider utilizing your DI Container to just inject a Func to avoid the overhead of maintaining an IUnitOfWorkFactory abstraction and implementation. The benefits of this approach are that it’s easy to implement and that it eliminates the need for introducing repetitive infrastructure code into your application services. This attribute can be registered with the global action filters, or for the more discriminant, only placed on actions resulting in state changes to the database. Overall, this would be my recommended approach for Web applications. It’s easy to implement, simple, and keeps your code clean. A similar approach to the use of a custom ActionFilterAttribute is the creation of a custom decorator. This approach can be accomplished by utilizing a DI container to automatically decorate specific application service interfaces with a class which implements a Unit of Work boundary. While this approach requires a bit of setup, it provides an alternate means of facilitating the Unit of Work pattern through a decorator which can be used by other consumers of the application layer aside from just ASP.Net (i.e. Windows services, CLI, etc.) It also provides the ability to move the Unit of Work boundary closer to the point of need for those who would rather provide any error handling prior to returning control to the application service client (e.g. the Controller actions) as well as giving more control over the types of operations decorated (e.g. IQueryHandler vs. ICommandHandler). For Web applications, I’d recommend trying the custom Action Filter approach first, as it’s easier to implement and doesn’t presume upon the design of your application layer, but this is certainly a good approach if it fits your needs. Out of the approaches I’ve evaluated, there are several that I see as sound approaches which maintain some minimum adherence to good design practices. Of course, which approach is best for your application will be dependent upon the context of what you’re doing and to some extent the design values of your team. 8 March, 2015. It was a Sunday. I recently started working with a new team that uses NUnit as their testing framework. While I think NUnit is a solid framework, I don’t think the default API and style lead to effective tests. As an advocate of Test-Driven Development, I’ve always appreciated how context/specification-style frameworks such as Machine.Specifications (MSpec) allow for the expression of executable specifications which model how a system is expected to be used rather than the typical unit-test style of testing which tends to obscure the overall purpose of the system. To facilitate a context/specification-style API, I created a base class which makes use of the hooks provided by the NUnit testing framework to emulate MSpec. I’ve published this code under the project name NUnit.Specifications. 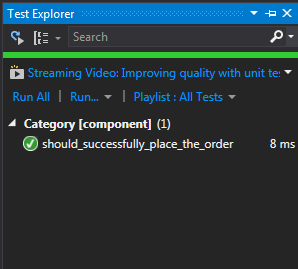 One caveat I discovered with the TestDriven.Net runner is it’s failure to recognize tests without the specification referencing types from the NUnit.Framework namespace (e.g. TestFixtureAttribute, CategoryAttribute, use of Assert, etc.). That is to say, it didn’t seem to be enough that the spec inherited from a base type with NUnit attributes, but something in the derived class had to reference a type from the NUnit.Framework namespace for the test to be recognized. Therefore, the TestDriven.Net results shown above were actually achieved by annotating the class with [Category(“component”)] explicitly. As a convenience, NUnit.Specifications also provides attributes for denoting categories of Unit, Component, Integration, Acceptance, and Subcutaneous as well as a Catch class (as provided by the MSpec library) for working with exceptions. You can obtain the NUnit.Specifications from NuGet or grab the source from github. 5 March, 2014. It was a Wednesday. When the term “agile” is used in reference to development processes, many seem to use the term to refer to some degree of adoption of a given agile framework such as Scrum, Extreme Programming, etc. rather than using the term to refer to the degree to which their teams are able to adapt to frequent types of changes that tend to hinder the success of projects. Some may argue that this distinction is merely one of precision of speech rather than of meaning, but the extent I’ve encountered nominal adoption of agile practices seems to argue to the contrary. It seems that many team’s first foray into agile processes is the selection of Scrum or other framework by their management teams who’ve heard that a given system can help them improve upon their processes. As a result, they send the managers and Business Analysts off to a few days of training for the selected framework. While there is certainly nothing wrong with this avenue, it’s part and parcel of the agile-process-as-commodity mentality that I believe tends to lead to poor adoption. Introducing a process like Scrum (or whatever portions of Scrum a company’s existing process will tolerate) will sometimes improve upon matters, but only insofar as one’s cargo-cult emulation of the prescribed practices happen to match up with the problems for which they were conceived. Unfortunately this approach to adopting agile processes often seems to lead to a bunch of people going through the motions without really understanding what the purpose is. Worse, when the local Scrum training consultants sell management on the fact that they don’t really have to give up things like deadlines, using business analysts to gather all the requirements, or otherwise restructuring their organization, they generally end up with some empty shell of a process which is really nothing more than their old waterfall process with more micro-management. Based on this definition from Merriam-Webster’s dictionary, being agile is “an ability to change, or adapt to change, quickly”. While communicating that you adhere to a given agile process does have its usefulness at times, thinking of your process in this monolithic way doesn’t promote the kind of thinking that leads to continuous improvement. Rather than thinking in terms of which process we use, we should think in terms of what aspects of change our processes help us adapt to. Many teams consider themselves to be agile based on a declared adoption of a given framework such as Scrum, or they may think of their organizations in terms of what percentage of a given framework they’ve adopted, but often have only adopted only some poor imitation of what the framework prescribes. One example that seems frequent is the practice of pseudo-iterations. Many organizations claiming to have adopted Scrum still follow a process where a fixed goal is initially established and the features perceived to meet the needs of the end goal are developed and tested in a series of time blocks until the product is released. Such teams may consider themselves agile, but should they finally deliver the product into the hands of real customers after a year of development only to find that the needs of the industry have changed, can they really say they are agile with respect to changes to the product’s desired features? Of course, there are some products whose minimal viable product is too complex for short iterations, necessitating some form of internal feedback loop (e.g. self-driving cars, space shuttles, etc. ), but generally with software systems, what is considered to be a minimal viable product is far from the smallest increment that can provide meaningful functionality to the end user. Rather than thinking of your team as “agile” or “not agile”, consider asking the following types of questions: How well does our team adapt to changes in requirements? How well does our code base adapt to changes in features, frameworks, and libraries? How well does our team adapt to the loss or addition of new team members? How well does our team adapt to changes in the distribution of knowledge and skill sets on the team? In order for teams to really become agile, they need to understand the common factors which hinder adapting to changes in the landscape of their market, their teams, and their code base. They need to be able to identify both when some aspect of their process isn’t resilient to change as well as when a given process is not necessary. Let’s stop thinking in binary terms of whether we are or are’t agile and begin continually reflecting upon how we might improve upon our processes to better adapt to the changes that affect our success. 17 November, 2013. It was a Sunday. ExpectedObjects is a testing library I developed a few years ago to facilitate using the Expected Objects pattern within my specifications to avoid obscure tests. You can find the original introduction to the library here. As of version 1.1.0, the ExpectedObjects library has been updated to include a feature called Custom Comparisons. The standard behavior of the library is to traverse a strategy chain (which is itself configurable) to determine which comparison strategy is to be used for each type of object encountered within the object graph. The Custom Comparisons feature allows you to override this behavior for specific properties. For Receipt.VerificationCode, expected a non-null value but found [null]. The ExpectedObjects library currently provides a static Expect class which includes convenience methods to check for null, not null, and an Any comparison for checking that an object is of a specific type (e.g. Expect.Any()). To supply your own comparisons, simply implement the IComparsion interface which defines the custom comparison and the text to include within any exception messages raised (e.g. “For SomeType.SomeProperty, expected [_text you supply here_] but found “42”). 17 April, 2013. It was a Wednesday. 27 January, 2013. It was a Sunday. In an application I was recently working on, a need arose to modify a section of code involving two entities which should have been modeled using a parent/child relationship but which only had a loose association in the database. The primary table in the database schema for what needed to be the parent object in the domain only contained a unenforced foreign key column which matched up with a candidate key on the table used for what needed to be the child object. In the section of code I needed to modify, a View Model was being created by first retrieving data for the parent object and subsequently for the child object. I’m not exactly sure what lead to this path, but I think it had something to do with the original developer’s attempt at using a surrogate key strategy for all the tables and later attempts by others to pull the data into a domain model with NHibernate. In this case the “MyEntityType” was another entity which had a many-to-one mapping with the aforementioned parent entity. After looking over the code and scratching my head for a bit, I decided to do a search on this particular error and read a few articles which at first didn’t seem to speak to my particular scenario. The advice I read basically boiled down to “Don’t try to do stuff with the session after you receive an error”. That certainly made sense, but upon stepping through the code I couldn’t see anywhere I was catching an error and proceeding to do something further with the session. I then decided to add a try/catch around the offending code and suddenly I saw the issue: trying to save an entity associated with one open session with an entity from another open session. When used within the context of our Web applications, this code would contain a call to register the ISession with an HTTP Request lifetime scope, but this import job didn’t require a shared ISession prior to my changes. To fix the problem, I added a call to register the ISession as InstancePerLifetimeScope() which causes the same lifetime scope used to resolve the job to be used for resolving any instances of ISession. Additionally, I added a try/catch/throw around the session to at least provide some logging of similar issues should this ever come up again.